After I managed to combine 2 dongles for an FFT in gnuradio, I wanted to pipe the output to gqrx and add 2 more dongles to the flowgraph. Due to the cut-off at the edges of each dongle, we get 8.4 MHz bandwidth, but since the rational resampler only supports integer values, our sample rate is 4*2.4e6 = 9.6. Use interpolation=35 and decimation=10 for the true sample rate of 8.4 MHz. I updated the 8.4 MHz flowgraph at the bottom of the page. You can even listen to analog signals, that are at the overlapping areas! 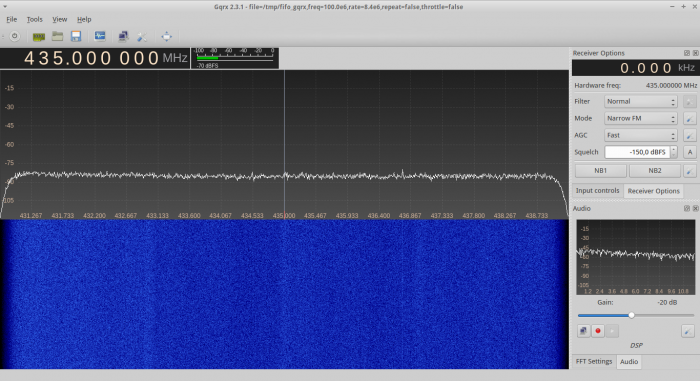 Also make sure, that you set the center frequency in gqrx. 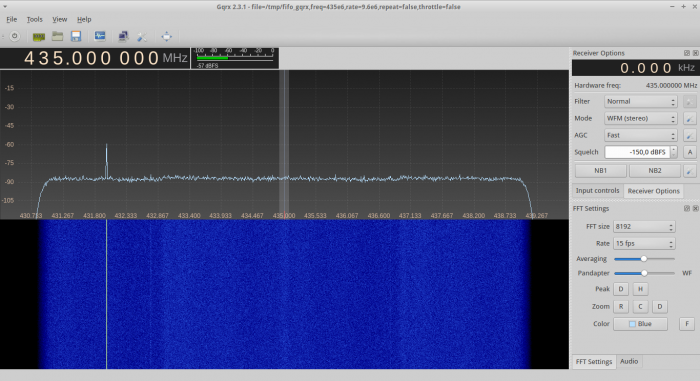 You might have to open gqrx some times if it crashes on startup, but it will work!